MOUNTAIN VIEW, California — Companies that collect data beamed down from small satellites say they expect partnerships and mergers will stem the rising number of new entrants offering ground station services in their market. Around half a dozen startups have popped up in the past few years offering ground station services for smallsats, Natalie Bednar, Swedish Space Corp.’s (SSC) business development director, said Feb. 7 at the SmallSat Symposium here. Those companies present a challenge to incumbent providers SSC and Kongsberg Satellite Services (KSAT), which have both been around for roughly 50 years. Bednar said both SSC and its Norwegian rival KSAT will likely lose market share to a more diverse group of ground station providers. So many startups have formed in this segment recently that until more frequent smallsat launches become a reality, the market lacks enough operators to support them all, she said. “To answer the question whether there are enough operators now to sustain that growth in ground segment services, my response would be today: no,” she said. The companies Bednar referred to (without naming them all directly) come in all shapes and sizes. Fellow panelists Atlas Space Operations and RBC Signals are both building out ground station networks around the world. European startup Leaf Space raised $1.5 million in November for a 10 ground-station network to be operational by 2020. In September, Japanese startup InfoStellar raised $7.3 million for a cloud-based platform to share excess ground station time on antennas operated by established satellite operators. Companies Analytical Space, Kepler Communications and Audacy are all preparing orbital-relay systems that can collect data from satellites using other satellites and send it to the ground faster than would be possible otherwise. Stig-Are Thrana, KSAT’s U.S. sales director, echoed Bednar’s point. “That’s a big part of the reason why we now operate 20 locations. We are distributed among all the world’s continents, and it’s still increasing because some of these big constellations coming up — they need a rollout of even more infrastructure than we have today. And of course there is going to be collaboration and regional synergies, but it’s also about collaborating with partners,” he said. Atlas Space Operations founder and CEO Sean McDaniel agreed. “Unless the infrastructure providers can cooperate in a way that meets that demand, we are going to see some service providers fall away from this market, and some of the current ones,” he said. Ground services providers said electronically steered antennas and optical communications are breakthrough technologies that will change the way they do business. Compared to traditional parabolic dishes, electronically steered antennas — such as the flat-panel mTenna that Kymeta began shipping last year — will let ground stations track and connect more than one satellite at a time. Optical communications offer substantially higher data rates than traditional radiofrequency communications, but cloud cover can be a problem for laser downlinks. 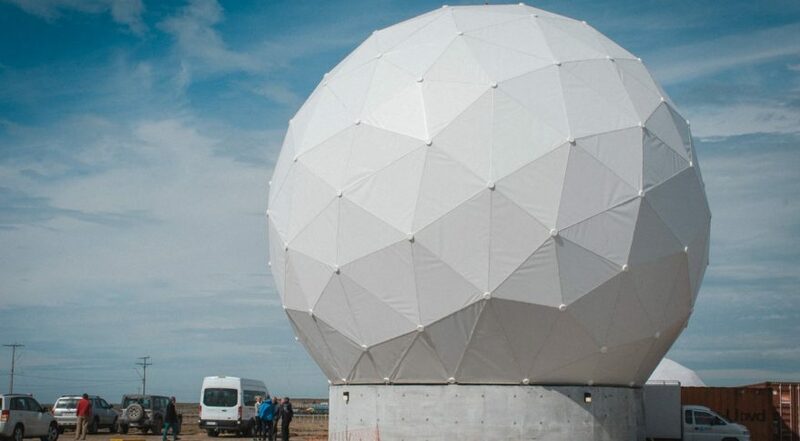 Bednar said SSC is working with BridgeSat, a startup building a network of optical ground stations, to locate some of those stations at SSC facilities. Groundbreaking has already begun for a few sites, she said. Thrana said KSAT is interested in both phased array antennas and optical communications, but sees limitations. Optical links need to be extremely precise, for example, and phased array antennas remain expensive. Richins said satellite ground-segment communications could start to resemble terrestrial communications as electronically steered attennas become mainstream. Geostationary satellite operators are investing in the technology to help make that happen. “Those things will trickle down and really empower a new model for ground services where every home or every car can be part of an array that is providing the ability to move data between space and the ground,” he said. McDaniel said Atlas is deploying a multibeam electronically steered antenna in Finland this March that can link to multiple satellites simultaneously. The system is based on radio astronomy array mathematics, he said, and is the culmination of a space act agreement partnership with NASA from last year. The Atlas antenna is a “fraction of the cost of an equivalently performing parabolic dish,” for sizes 3-meters and up, he said. Smaller antennas would still be too costly unless a customer strongly preferred to have multi-satellite tracking ability, he said.